The Prophecy Answer Book deals with Biblical prophecy concerning End Times. While I know the Bible is true, and full of prophecy on the subject, I have always been so busy dealing with the here and now that I haven't spent much time studying End Times Prophecy. This book is designed for just such a reader, someone who already believes the Bible to be true, and knows these prophecies are there, but has never really studied them. It is almost like a Frequently Asked Questions book for End Times Prophecy. 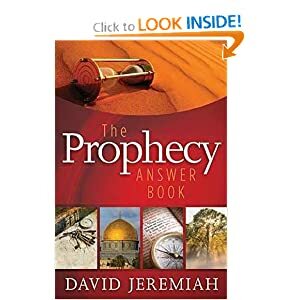 The Prophecy Answer book is a handy reference tool by Dr. David Jeremiah. Dr. Jeremiah is well-known for his sound theology, and is a trusted source of information on this topic. In the book, Dr. Jeremiah addresses common questions regarding Biblical prophecy, in a question-and-answer format. The book is divided into seven sections, to make it easier to find the answer to your specific question: Current Events, The Rapture, The Tribulation, The Antichrist, The Second Coming, The Millennium, and The New Heaven and the New Earth. This book is not a page-turner, but it's not designed to be one. If you are looking for solid, Biblical answers to questions about prophecy, this book is a great tool. This would also make an excellent gift book for friends who are interested in Biblical prophecy. I received this book from www.booksneeze.com, and am glad to have it in my library!